The goal of this master’s programme is to educate students capable of engaging in interdisciplinary discourse. 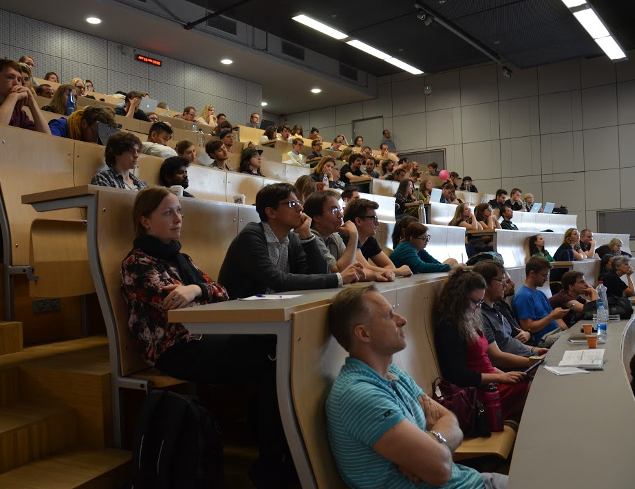 MEi:CogSci is a two-year master’s programme (120 ECTS). It is designed as a research-based curriculum with a strong focus on project and team work, aiming to support and cultivate interdisciplinary thinking. The first year of your studies introduces you to the core disciplines, concepts, and methods of cognitive science. The second year is phenomenon and research oriented, which means that you focus on a cognitive phenomenon of your choice and study it from an interdisciplinary perspective. 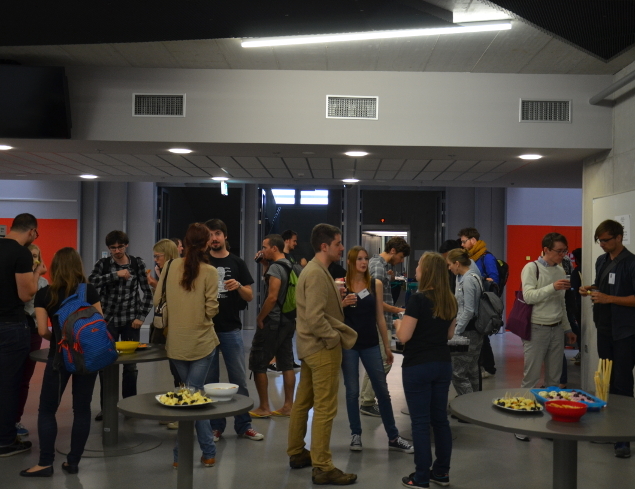 You will spend your third semester (30 ECTS) abroad at one of our partner universities (mobility semester). To acquire the necessary knowledge and skills to succeed in interdisciplinary work, MEi:CogSci is organised around three core themes: (1) disciplines, (2) methods (tools), and (3) integration. This organisation of the curriculum is depicted as “columns” in the image below. 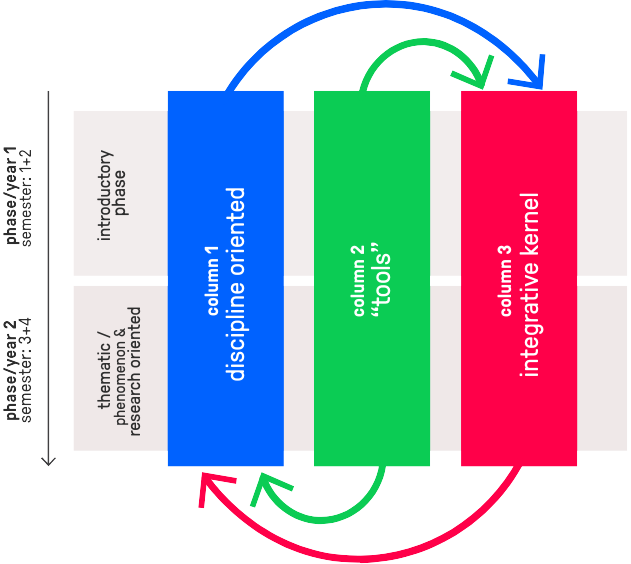 1) Despite its interdisciplinary character, students need to complement their previous studies by acquiring basic knowledge in at least two new core disciplines of cognitive science (“disciplinary oriented column”). 2) Students are introduced to programming and statistics and can acquire further methodological skills (e.g., computational modelling, fMRI, EEG, philosophical argumentation, etc.) via courses and project work (“tools column”). 3) Integrative courses open up discourse on research paradigms, concepts, models, and approaches specific to cognitive science. They are the core component of this curriculum. These courses focus on interdisciplinary interaction and integration, on reflecting one’s premises, and engaging in dialogue between scientific cultures (“integrative kernel column”). You start your studies at the partner university of your choice. For detailed information on the local curriculum implementations, courses offered, and application procedures, please visit the partner universities' local MEi:CogSci websites. MEi:CogSci aims to provide learning settings that foster individual and critical thinking, as well as collaboration and appreciation for different (scientific) perspectives. By enriching classical educational formats with project-based learning and interdisciplinary teamwork, we aim to facilitate a dedicated learning community for both students and instructors. The MEi:CogSci programme is designed as a research-based curriculum, involving project work from the very beginning. This may entail work in research labs, or individually tailored and supervised research projects. Interdisciplinary research calls for collaboration. On the one hand, students and instructors jointly explore cognitive phenomena from different disciplinary perspectives in the context of courses. On the other hand, students have the opportunity to team up and work on joint research projects. Challenging one’s assumptions and patterns of thinking fosters epistemological and personal development. Students will encounter diverse, and sometimes conflicting disciplinary approaches. Questioning how we can understand certain cognitive phenomena from different perspectives is a crucial part of an interdisciplinary mindset. Collaborating across disciplinary boundaries can be demanding and challenging. We strive to create an atmosphere of openness and mutual respect as this is vital for reflecting and integrating different (disciplinary) perspectives. As an interdisciplinary study programme MEi:CogSci spans across departments, faculties, and even universities. MEi:CogSci also collaborates with non-univiersity research institutes. Students are invited to not only further their intellectual and academic skills within this broad scientific infrastructure, but also experience what it means to learn, study, and do research in different countries. Our network of partner universities — each with their individual research interests, traditions, and cultures — provides students with the opportunity to not only engage in interdisciplinary, but also intercultural discourse. 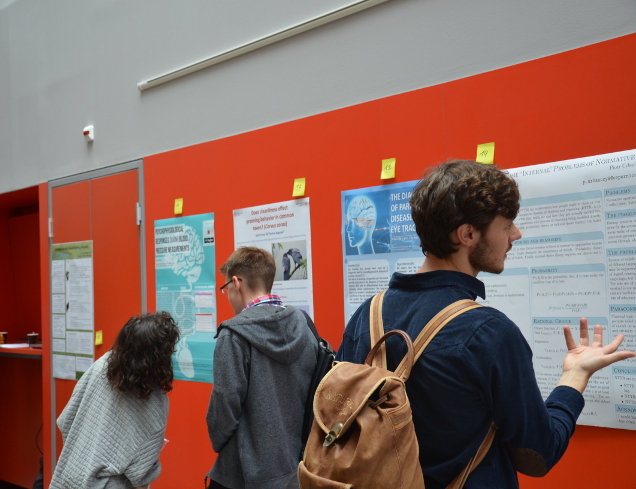 A highlight of the academic year is the MEi:CogSci Conference, where students experience the process of taking part in a scientific conference firsthand. Students write a scientific abstract, go through a peer-review process, and present their work at the conference. This also results in their first publication in our conference proceedings. You can have a look at the latest Proceedings of the MEi:CogSci Conference and visit the MEi:CogSci Conference website. Some MEi:CogSci master's theses are availaible online here and here. MEi:CogSci is a joint master’s programme. Ultimately, a joint academic degree will be awarded by the participating institutions. Thus, each student has to acquire at least 30 ECTS at one of the international partner universities (in the third semester).